For Disney vacationers, the biggest news to come from the company’s recent annual meeting was a pleasant shocker. Disney Chairman Bob Iger announced that Disney Cruise Line has just placed orders for two new cruise ships, due for delivery in 2021 and 2023. I can’t exactly say I'm speechless (this article is proof of that), but it was nothing I’d have expected. Fireworks went off at the finale to the christening ceremony at Port Canaveral on January 19, 2011. The new ships are to be built by Meyer Werft, the same shipyard that brought us the Disney Dream and Disney Fantasy. They’re slated to weigh in at 135,000 GRT, which is just a tiny bit larger (3.8%) than the Dream and Fantasy (130,000 GRT). That difference could mean something as small as a tweak in hull dimensions to improve stability or energy efficiency. The announced number of staterooms (“about 1,250”) is identical to the Dream and Fantasy, but that number is approximate, and doesn’t tell us what the capacity of those staterooms might be. If we extrapolate from that 3.8%, there could be another 48 staterooms of identical capacity to today’s, with up to 152 more guests. Or they could stick strictly to that 1,250 stateroom number but increase the capacity of some of them (more Family staterooms sleeping up to five, suites sleeping six guests or more, etc.). Or they could stay strictly at 1,250 staterooms and 4,000 maximum guests, and use the space for exciting new public facilities. So many possibilities! Even so, 3.8% is not a very large difference, so the overall cruising experience will probably be quite similar to the Dream and Fantasy. I seriously doubt we’ll hear many cruisers say, “I don’t like the new ships, the Dream and Fantasy seem so much more intimate!” On the other hand, DCL’s original announcement for what would become the Dream and Fantasy slated those ships at 122,000 to 124,000 GRT, well below their eventual size, so take all that I just said with a very large block of sea salt. Five to seven years is a long time, but time has a way of cruising along. DCL announced plans for (what would become) the Dream and Fantasy in 2007, and the ships were delivered in early 2011 and 2012. So this time, they're about a year or two farther out on the time line. That is, in part, by necessity, as the shipyards are already booked through 2020. News about the new ships may be quite scarce until 2019, when DCL will announce the early part of the 2021 cruising schedule and construction work will likely begin on the first new ship. It’s not hard to predict that there may be teaser presentations via D23 for several years prior to the keel-laying. The rumor mill probably won’t pick up steam for another year or two, though there’s already lots of speculation on matters like the ships’ names and potential ports of call. The cruise industry’s construction schedule for 2021-2023 is pretty wide open, though that doesn't mean the shipyards aren't negotiationing with all the other cruise lines out there. For years, we've wondered how many more staterooms the cruise industry can profitably operate (more ships, and larger ships with more staterooms), but it seems there's no end in sight. There are even new lines on the horizon, most notably Virgin Cruises, a new three-ship line headed by the legendary Richard Branson and former DCL President Tom McAlpin. The additional year's separation between the launch of the fifth and sixth ships may have something to say about pent-up demand, perhaps less than DCL was facing way back when the “tiny” Magic and Wonder had to absorb all demand. Still, the Dream and Fantasy propelled DCL to the top of cruise industry surveys, so there are far more DCL loyalists today than there were in 2010. We also know that Walt Disney Imagineering likes to have some time to refine its designs once the public starts to experience newly-opened parks and recently-launched ships. We saw that with the Fantasy, most notably up on the recreation decks with AquaLab and Satellite Falls. With an extra year to plan, Ship Six (OMG, is it possible that they’d name it Disney’s Big Hero 6?) could potentially have more differences of that sort. As I noted when the Dream and Fantasy were hitting the water, filling an additional 1,250 staterooms per ship, week in and week out, was quite a marketing challenge. An extra year's spacing between the ships may make that easier to profitably swallow (excess stateroom capacity means lower demand-driven rates). Of course, the more staterooms there are in service, the easier it’ll be to assimilate “just” another 1,250. Then, there's the question of potential cruise markets for all six ships. The same question arises now as it did when the Dream and Fantasy were announced. What of the smaller Magic and Wonder? It's an easy leap to assume that the new ships will replace the line's oldest ships on itineraries (and at home ports) that see the highest demand, with the Magic and Wonder serving smaller and experimental markets. Has the Miami beachhead been sufficiently established that the Magic and/or Wonder will winter somewhere other than Miami and Port Canaveral? That could mean more departures from San Juan and Galveston, a return to the Mexican Riviera out of San Diego or LA, or maybe even Bermuda/Bahamas from NYC. Or things could get more exotic. The thought that DCL will test the Asia/Pacific market is still hanging out there. Cruisers report that Commodore Tom Forberg recently suggested that region as a possibility for one of the then-rumored new ships. It seems more likely that Disney would first send one of the older ships, at least to test the waters. I’ve long liked the notion of a cruise that connects the Asian theme parks (900 nautical miles between Hong Kong and Shanghai, 1000 Shanghai-Tokyo, 1600 Hong Kong-Tokyo). Either a Hong Kong-Shanghai round-trip or a one-way Hong Kong-Tokyo could be a 7-nighter. After that, there’s a long list of itineraries possible when calling on ports in Australia, New Zealand, Indonesia, Thailand, Malaysia, Taiwan, Korea, Russia, Hawaii, India, Vietnam… Longer itineraries seem more popular in that region, too (U.S. vacations are short by international standards). Airfares being what they are, most passengers for those itineraries would likely be drawn from the region, rather than Europe or the Americas. A ship could be permanently based there, sailing China/Japan during the Northern Hemisphere’s summer, then heading below the Equator to Australia/New Zealand/South Pacific for the other half of the year. Of course, an annual pair of repos to the U.S. via Hawaii has something to say for it (Alaska for the summer, Australia/South Pacific the rest of the year), but if things work out in Asia, several years may pass without the need to reposition. Cuba is an emerging possibility, served from Miami, Galveston, San Juan, New Orleans, or even Tampa (that port actively courted DCL when the line’s contract with Port Canaveral was under review). 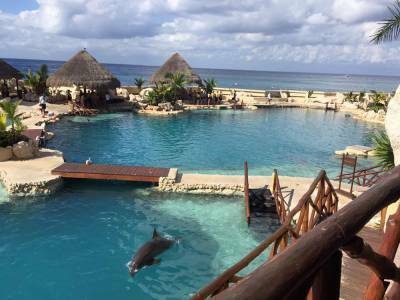 The Caribbean’s largest island has several potential cruise ports, few, if any will be ready to handle the crowds that arrive on today's mega-ships. Again, it’s easier to imagine the Magic or Wonder on those routes. Alaska is another matter. I expect either the Dream or Fantasy to head to Alaska for the summer just as soon as the nearly finished Panama Canal expansion allows. The Alaska itinerary is certainly popular enough to justify assigning a larger ship. When might that be? The canal’s new locks and control systems are currently being tested, with navigational trial runs set to begin in May. All the ports on DCL’s regular Alaska itinerary have already geared up to handle ships the size of the Dream Class, and are raring to go! Since the cruise line has yet to announce its Summer 2017 season, we might hear, “Disney Fantasy is heading to Alaska in 2017” within the next month or two (March or April 2016). Or maybe DCL will wait until the locks are open for business before committing. None of DCL's ships have been optimized for cool-weather cruising (Alaska and Northern Europe), which mostly means having a retractable covering for the pools. If one or both of the new ships come suitably equipped, we can expect they'd take over the Frozen itineraries. What about Castaway Cay? Just how many more port visits can it handle? In 2015 there were 203 scheduled calls at Disney’s private island. In 2016 that’s bumping up to 223. That still leaves 142 days in the year when the pier stands empty. That’s enough for two additional visits weekly while still leaving some down time for maintenance. 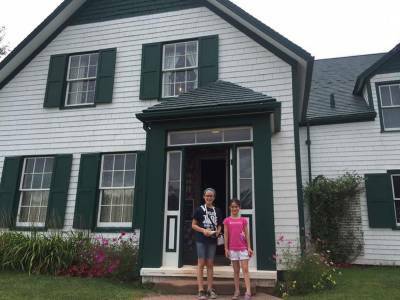 It’s also true that much of the island’s acreage remains undeveloped. Eventually, the island might support simultaneous visits from two ships, but it doesn’t seem likely they’ll need to do that as a “mere” six ship cruise line. The same holds true for Port Canaveral, which will see 187 DCL departures in 2015, with up to three ships departing from the cruise line’s home base during the winter and spring seasons. DCL could simultaneously home port four or five ships there without further expansion of terminal capacity. There is also the question of how much longer DCL will operate the Magic and Wonder. They'll be well over 20 years old when the new ships arrive. Both are already at a disadvantage to newer ships when health inspection time rolls around. I don't think Disney can get away with operating ships that score lower than 90% on those inspections, and as time passes, poorer scores become a stronger possibility. That could mean major overhauls of the ships' kitchens and sanitation facilities (say, one in 2022, the other in 2024). Then there’s the problem of keeping up with the evolution of the cruise industry and cruiser expectations. Still, I doubt the Disney Magic or Disney Wonder would be retired to Yesterland.com before their 40th birthdays. Rather than end on that somber note, I'll say a word or two about Meyer Werft, the shipyard that will once again play Bob the Builder on behalf of Walt Disney Imagineering. Since the Dream and Fantasy left the Meyer yard in Papenburg, Germany, the Meyer family acquired the STX shipyard in Turku, Finland. That yard typically produces one cruise ship per year, which increases Meyer's large ship capacity by 50%. The yard also has a subsidiary that prefabricates over 6,000 cruise ship stateroom interiors annually. Meyer also builds river cruise ships in a third shipyard in Rostock, Germany, but I'm not sure this is the time or place to speculate about DCL's future on the Rivers of the World (and no, that's not yet a theme park attraction). After all, Adventures by Disney has just recently started offering river cruises, so they’re still just testing the waters. Finally, back when Disney Cruise Line was first announced, Disney’s legendary former president, Michael Eisner, suggested the fleet could grow to eight ships. For years afterwards, that seemed like an impossible dream. Even after the announcement of the Dream and Fantasy, it seemed a remote possibility. Now, however, the goal seems attainable. With new ships arriving just about every 10 years, it’s possible you’ll read first-hand coverage of the eighth Disney cruise ship in the 30th Edition of PassPorter’s Disney Cruise Line guide! 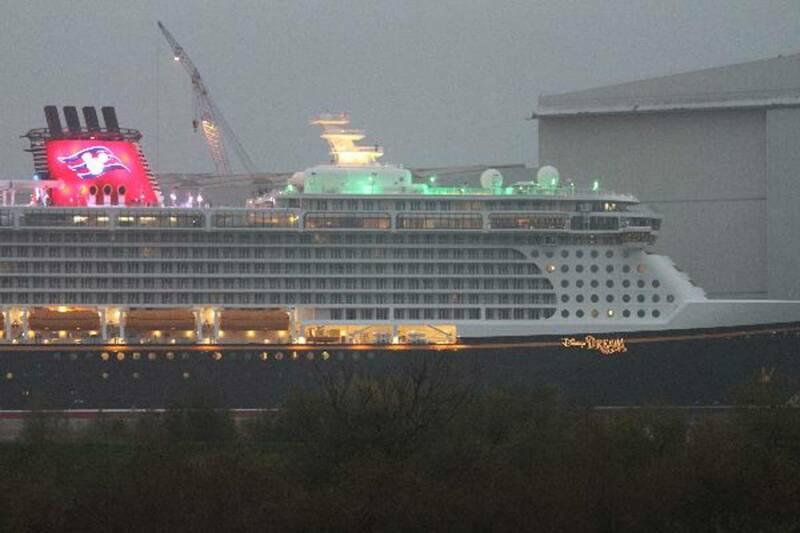 The new Disney Dream ship floats out of the Meyer Werft shipyard in Papenburg, Germany. 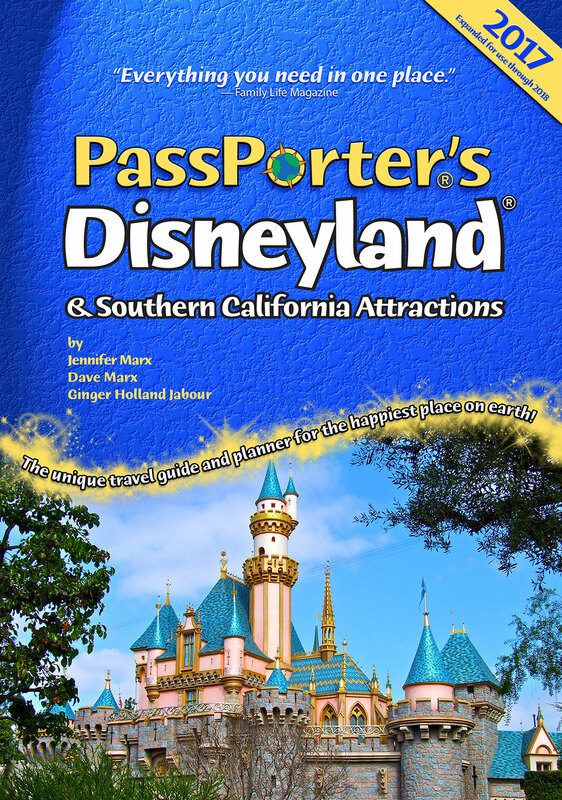 Dave Marx is co-founder and Publisher of PassPorter Travel Press and is co-author of PassPorter's Walt Disney World, PassPorter's Disney Cruise Line, and PassPorter's Disneyland and Southern California guidebooks. When he's not exploring and photographing theme parks and cruise ports you might find him, camera at the ready, hiking or paddling about in boats far smaller than any cruise ship. Looking forward to the new ships!! I wish there was more to add, but we do have some time!